Socialism isn’t a foreign concept in America. At the height of its power, The Socialist Party held 1,200 public offices and boosted 135,000 members. So what happened? Well, a whole bunch of different things but socialism in America has always taken its biggest setbacks when the politicians chose political interests and holding office over the needs of the people. We really need to start with Eugene Debs. Debs began as a Democrat. And it was as a Democrat that he held his first public offices. His radicalization began with the railroads. After goons, Pinkerton Agents, and the Federal Government killed the 1888 Burlington Railroad Strike, Debs organized the massive American Railway Union. ARU won huge against The Great Northern Railway, but weren’t so lucky in their next big battle. The Pullman Company cut wages by 28% triggering an ARU strike. When the union applied the force of 80,000 angry workers against the railroad, the Government again intervened on behalf of business interests. They issued an injunction against the striking workers for “interfering with the delivery of the US Mail.” President Grover Cleveland sent the Army to enforce the injunction. The Army was successful but breaking the strike resulted in 13 dead workers and nearly $80 million in property damage. And Eugene Debs went to jail for the first time. A man named Victor Berger visited Debs in jail. Berger was a socialist journalist who later became a career politician and founding member of the Socialist Party. He left Debs with a copy of Marx’s Das Kapital. So Debs comes out of prison a socialist and then spends the rest of his life fighting for that cause, helping to fund the IWW (Industrial Workers of the World) and the Socialist Party, not to mention being a 5-time candidate for President. Unfortunately, if Debs didn't tow the party line, the Socialist Party might have fared a lot differently. The problem with the Socialist Party came down to factions. There were a lot of them, but two primary ones butted heads hard. 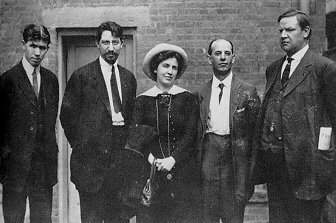 You had the electoral faction, the career politicians like Victor Berger and his “Sewer Socialists” (a pejorative term for the socialist politicians from Milwaukee who thought the best focus was on public health programs and not revolution) and you had the radical faction from the IWW, primarily working men whose experience with government was as the tax-funded muscle the businessmen call when the hired goons failed to bust enough heads to convince people to shut up and be happy they have a job. The electoral faction thought the IWW guys were anarchist thugs that just wanted to cause trouble, and the IWW guys thought voting accomplished nothing but sending another Congressmen to Congress. Haywood (far right) and strike leaders. This came to head with the Lawrence Textile Strike. Under the IWW banner, the strike united a workforce composed largely of women and immigrants, representing over 51 different nationalities. The strikers won but the battle was intense, taking place over two months during a particularly brutal winter. At one point during the strike, elected city officials called in the police who used their clubs on children. In response, Big Bill Haywood, IWW leader and organizer of the strike, did the thing the electoral faction hated most--spoke out against politicians. The Socialist Party's response to Haywood's speech was to oust him and his “anarchist thugs” from the party by passing measures against all direct action. The party never recovered. Membership dropped. Then the elected socialists lost their offices one by one. 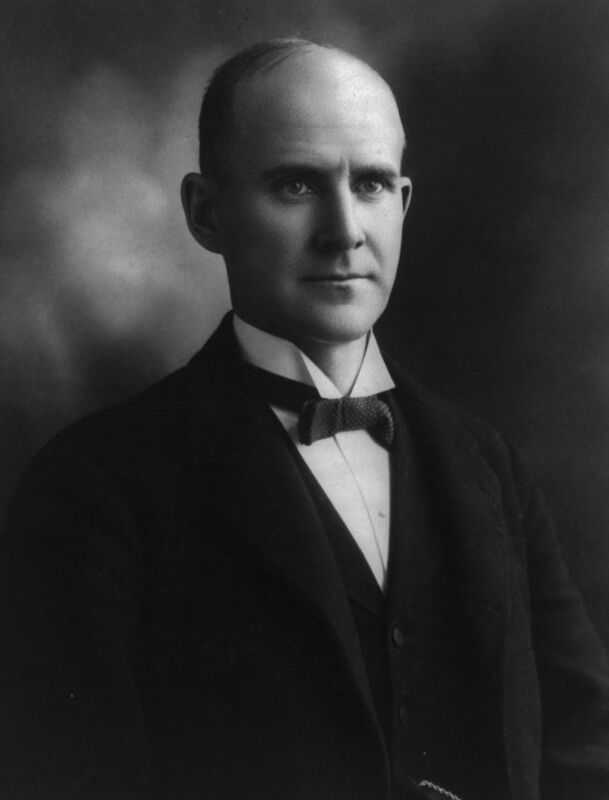 The only person who could have saved Haywood and the radical faction was Eugene Debs. He was the all-around hero of both the IWW and the Socialist Party. All it would have taken is one word from him to stop the career politicians from ousting the workingmen and the radicals, but he didn't. He kept his mouth shut and towed the party line and so sealed the fate of the Socialist Party in the United States. World War I came along and the AFL cut a deal with the federal government: we'll support the war effort and help you crush other more radical and left-leaning unions in exchange for favors and preferential treatment. Then at the tail end of the War, came the Russian Revolution. Western Industrialists tend to get really, really nervous when people organize against the corrupt powers in charge, let alone when they win. Not to mention, the Bolsheviks signed The Treaty of Brest-Litovsk with the Central Powers in order to turn their resources away from the War and instead focus on their own Civil War. When the Russian Civil War was over in 1922, the Bolsheviks had triumphed over more moderate socialist groups like the Mensheviks and the nationalist, pro-Tsar White Army. Before Stalin rose to power and made “socialism in one country” policy, the Soviets backed Lenin’s belief that revolution in one country was insufficient. There needed to be a “permanent revolution,” as Trotsky called it--this belief eventually earned Trotsky forced exile and, later still, an ice axe to the head. Apparently, no one liked the sound of permanent revolution. The next blow came when FDR sold out Henry Wallace, the most liberal member of his cabinet, for someone the mainstream Democratic Party preferred more--Harry Truman. This all of course eventually set the stage for the Red Scare and that was pretty much that. So now, where do we find ourselves? Facing an election where the Democratic Party, the so-called "liberal party", is looking out for party and corporate interests over our wellbeing by ramming a corporate-shill warmonger down our throats. Meanwhile, Bernie Sanders, the man who could have done something about it, chose instead to follow the party line. History really does repeat itself. The problem is when history repeats itself, the people suffer.